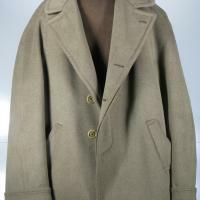 The woolen material that was used to make this coat was woven at the Assabet Mills, American Woolen Company, Maynard. Postcard, in Finnish, sent from Annie Hnikan(? 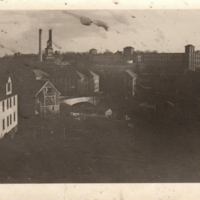 ), Sudbury Rd., Concord to Mary Anderson, Maynard in 1920. 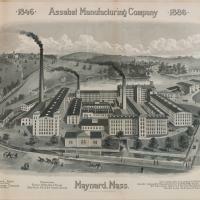 A lithograph of the woolen mill as seen in 1886. 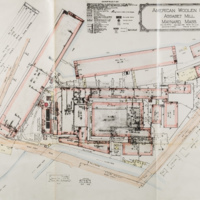 Amory and Lorenzo Maynard's houses are shown on the hill in the upper left corner. 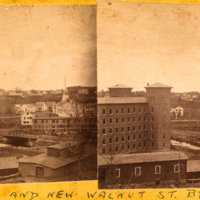 View is from Walnut Street. 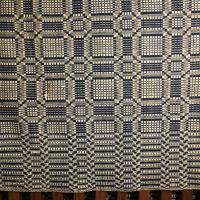 Lorenzo Maynard was the agent at this time. The buildings in red are made of brick, the yellow are made of wood. 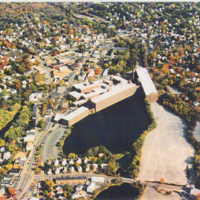 A colored photo of an aerial view of the Mill. 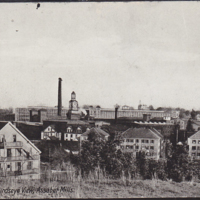 Copy of a post card of the mill area taken from Summer Hill. 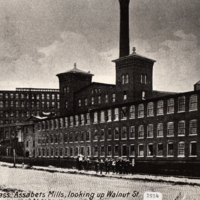 A photo of the Assabet Mills taken from Beacon Street. 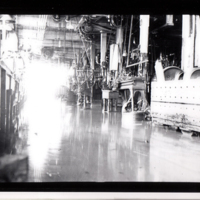 A black and white photo of Gavin Taylor, the overseer of the finishing department of the Assabet Mills. 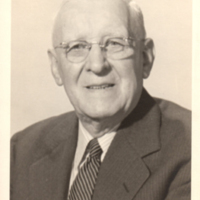 Mr. Taylor was active in town affairs and was a Water Commissioner for many years. 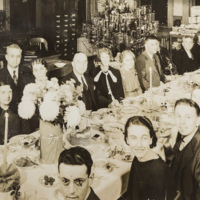 Christmas Party photograph of the Main Office of the American Woolen Company. 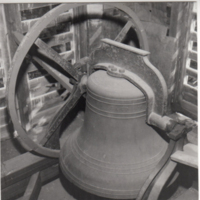 Eva Edwards Frye is noted in the original accession record. 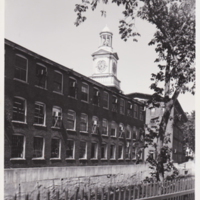 During the flood of the Assabet River on March 13,1936, the river rose high enough to spill over its banks and to include the Walnut Street machine shop in mill Building No. 11 as part of the river. 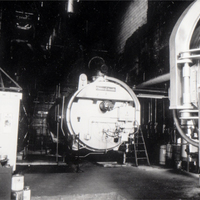 This is one of the large boilers used to heat the mill buildings. 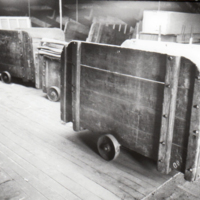 The boilers could be fired by either gas or oil with an easy conversion. 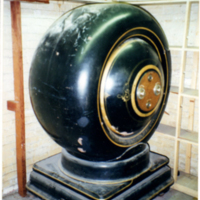 This large floor safe was installed in the main office building in the Assabet Mills. 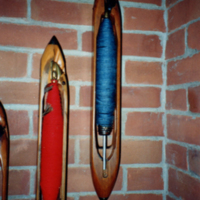 This shuttle with a bobbin of Khaki yarn was used in the Assabet Mills during World War One. 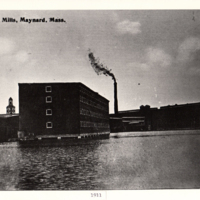 A photo of the Assabet Mills new storehouse building built in 1911. 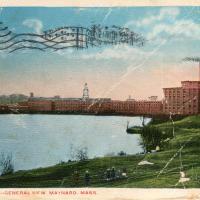 A photo of the Maynard Mills looking up Walnut Street, dated 1914.